Qlik Sense is in many ways a more advanced platform than its predecessor, QlikView. Scalability, rich APIs, enterprise-level administration -- there are many features of a good architecture in it. However, what can be challenging for Qlik Sense customers (besides dealing with rudimentary data visualization) is automation. QlikView had embedded VBA scripting engine, which let designing automation scenarios initiated by users, but Qlik Sense doesn't have it. Disabled in the standard mode EXECUTE statement only aggravates the situation. Database writeback based on current selection in Qlik Sense. One-click export of a subset of data from a Qlik Sense app into an external system or a disk folder. Sending personalized emails with attached customized data extracts from Qlik Sense. Downloading a particular file from a web-site and dynamically adding its content to a Qlik Sense app. Automated data quality checks of incoming source data with rule-based email notifications. Actions are initiated by a Qlik Sense user by clicking a dynamically generated hyperlink, or an extension button. This triggers an EasyMorph Server task which runs an EasyMorph project with specified parameters (passed through the hyperlink or extension). The project performs required actions with external files and systems. Finally, the task status is reported back into the Qlik Sense app that initiated it. Alternatively, the task initiates a full or partial reload of the app using the REST API. In one Qlik Sense application there can be multiple action buttons that initiate different actions. It works well with tiered Qlik Sense apps, where one app is for ETL, another for building a data model, and another one for the UI objects. Closed loop feedback: task status and result are reported back to the user. If the task fails the errors will be reported to the user as well. Task parameters can be assigned dynamically using Qlik Sense variables and expressions. The action server can be hosted on a different machine thus reducing exposure of the Qlik Sense sever. Executing external applications and Windows shell commands. File commands: copying, downloading, unzipping, etc. 90+ ETL transformations and 100+ functions. An interactive Qlik Sense app extension for triggering EM Server tasks and monitoring task status and errors in real-time. The Qlik Sense Command transformation for triggering reloading Qlik Sense apps and QMC tasks right from EasyMorph projects. Fetching emails and processing attachments. In this case, a user triggers (through a link or extension) an EasyMorph task that generates QVD files (one file per one table in data model) and initiates reloading of the Qlik Sense app that called it. The app loads the generated QVDs. If you would like to talk about about automation for Qlik Sense, send me an email (you can find my address in the upper right area of this blog or here). To receive future updates on EasyMorph and its integrations with Qlik and other systems, subscribe to our newsletter on the download page. Effective January 1st, 2018 EasyQlik QViewer has been acquired by Rob Wunderlich. I believe it's a great outcome for the product, its users and customers. It was a bit challenging for me to keep focus on QViewer and EasyMorph simultaneously, which resulted in a slower development pace for QViewer. It's hard to imagine a better new owner than Rob who is well known in the Qlik community and who surely has a great vision on what would make QViewer even more useful. From now on, the existing licensed QViewer customers should contact support@panalyticsinc.com for all questions related to QViewer. The website http://easyqlik.com keeps operating as usually. I, from now on, focus solely on EasyMorph. Read also Rob's statement on the acquisition. Hi there! My name is Dmitry Gudkov. I used to work in the area of BI and analytics since 2004. 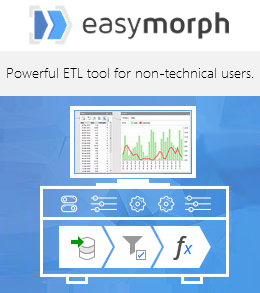 In 2014 I founded EasyMorph that created a pretty cool data transformation and work automation tool for people without a technical background. Before that I made QViewer — a popular standalone QVD file viewer, later acquired by Rob Wunderlich. While I'm no longer focused on analyzing and comparing various BI/analytical systems, I still occasionally write about the market and technology in general.